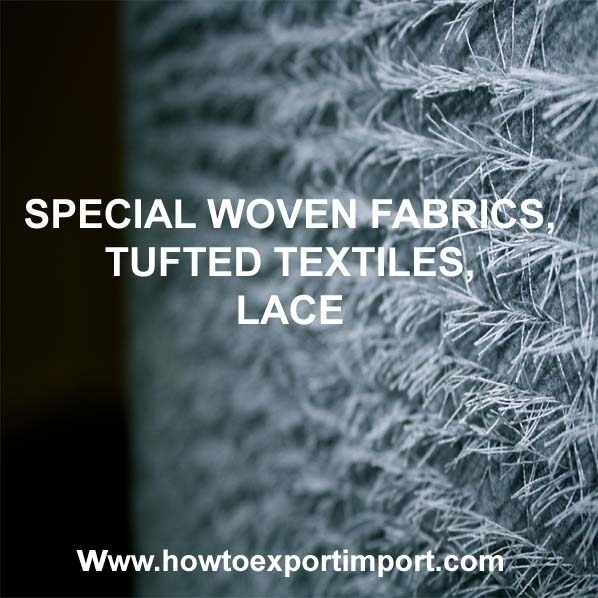 In this article, the Harmonized System codes (Harmonized Tariff System- HTS) for SPECIAL WOVEN FABRICS, TUFTED TEXTILES, LACE are mentioned which help you in exporting and importing of SPECIAL WOVEN FABRICS, TUFTED TEXTILES, LACE. These codes help exporters and importer all over world to know product classification code named differently in each country like Schedule B, ITC, HS, HTS, Tariff Code etc. 5804 tulles & other net fabrics, lace in pc, strip etc. 5808 braids in pc, ornamental trim in piece etc, tassels etc. Chetan Vyas: On 04 August 2015 Please give me hscode printed fabric on Viscose Spandex (95% Viscose and 5% Spandex). Dipa: On 12 October 2017 Hi, Thanks for sharing like this informative post in world of textile. i mostly used to visit Fabricsnlaces. They are the Fabrics and Chemical Lace Manufacturer India who are exporter and book bulk order from across the world. 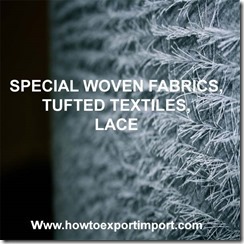 Formalities to export tufted textile fabrics, lace,tapestries,trimmings,embroidery etc.